When I was in school, we had a book of English prose examples which included an extract from the Aeolus section in Ulysses. At the time, even without the context of the rest of the book, there was something remarkable about it. The writing was so rich and evocative that it has stayed with me ever since. Here’s a section from the original, where a bunch of newspaper men are talking and one of them paraphrases a speech. …When Fitzgibbon’s speech had ended John F Taylor rose to reply. Briefly, as well as I can bring them to mind, his words were these. Mr Chairman, ladies and gentlemen: Great was my admiration in listening to the remarks addressed to the youth of Ireland a moment since by my learned friend. It seemed to me that I had been transported into a country far away from this country, into an age remote from this age, that I stood in ancient Egypt and that I was listening to the speech of some highpriest of that land addressed to the youthful Moses. This was my first brief dipping of a toe into Ulysses and it would be another twenty two years before my complete baptism when I finally managed to read the entire thing. Why did Ulysses make such an impression when I did finally read it? Well, it was by an Irish writer and it was about my home city of Dublin. It was Irish like Bewley’s coffee shop. Just as warm, nicotine stained and full of wondrous conversation, philosophy, speculation and it was thought-full. 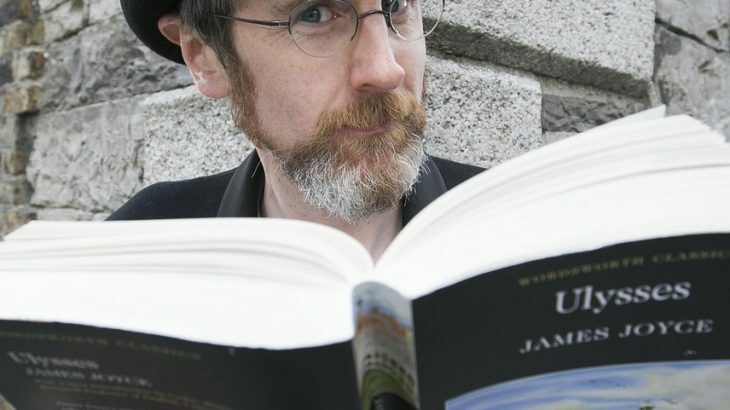 Ulysses became as precious to me as the Book of Kells and as stimulating as the National Library. It was as spontaneous as Grogans pub, as poignant as Glasnevin Cemetery and as fertile as the Botanic Gardens. 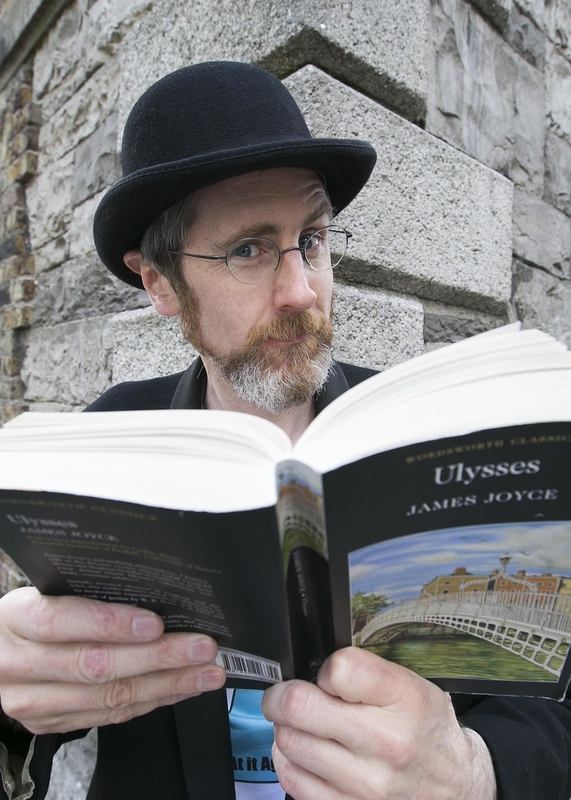 Ulysses celebrated my city and it in turn was celebrated around the world. I felt proud that James Joyce had a crack at forging in the smithy of his soul the uncreated conscience of his race. He didn’t care whether anyone thought he was pretentious or not. Joyce was a rebel and a genius as well as a family man. But as much as anything else he was a hard working Irish writer who despite great adversity would not compromise his vision. He was Icarus and he was Daedalus, a lifelong student and a teacher. Ulysses has opened up new friendships and projects, given me a rich appreciation of the extraordinary city of Dublin and continues to inspire me as an artist. That is why I love it. You might fancy a copy of our illustrated Ulysses guide. Romping through Ulysses breaks down the novel by James Joyce into bite sized chunks, and gives you ideas on things to do, what to wear and is packed with maps, insider titbits and Ulysses quotes to help you explore the life and times of this iconic Irish writer and Dublin, the city that inspired him. This blog post was written by James, a nervous wire of kinetic and creative energy. Prone to caffeine and sugar highs, this book-loving ideas man should not be fed after 7pm. Uncategorized Books, City guide, Dublin, Dublin trip, Famous Irish Writers, gifts for booklovers, gifts for readers, Irish Classics, Irish Literature, Irish Writers, James Joyce, literary gifts, Ulysses. permalink.